Travis has been in the transmission business since 2003. He is from Topeka, KS and got his start at his dad’s shop sweeping floors. He came to Certified Transmission after 10 years as a transmission tech at a Ford dealer, and he has the A2 and A3 ASE Certifications and is working on more. A customer showed up at our shop with a 2008 Chevrolet Impala SS that was equipped with the 5.3 LS engine and a 4T65E transmission. The customer had a complaint of an erratic speedometer while driving. I began by collecting all the vehicle information for a check out sheet, such as VIN, mileage, engine, and transmission type. After filling out the vehicle information section I set about to begin my diagnosis. First I checked codes and found the vehicle had no transmission or engine codes, but it did have a RF wheel speed sensor code which did not seem likely to cause the problem, but I kept this in mind anyway. I was suspecting a possible output speed sensor issue or maybe even an instrument cluster issue. I set up my scanner to monitor certain transmission PIDs such as TCC duty cycle, TCC slip, gear command, RPM, and the output speed sensor (among others) and set out for my road test. At first the vehicle did not act up and I was starting to wonder if it even had a problem. After a couple of miles, sure enough the speedometer jumped back and forth a few times spiking as high as 60-70 mph just shortly after beginning to move; no way could this be correct. Every time this happened was when I took off from a stop, and this was a pretty good clue for me. The vehicle speed PID goes from zero to 23 MPH instantly and the output speed sensor goes from 0 to 1010 RPM at the same time. I wanted to rule out possible interference from the alternator so I ran an electrical system check and ripple test which is standard operating procedure here, and no problems were found with the charging system. After this I decided to raise the vehicle and start looking for other possible causes. In the past I have seen internal transmission failures that drop large amounts of metal debris. This debris will stick to an output speed sensor and cause erratic readings of the output speed sensor. Next I set off to identify these wires hoping to find they were a part of the output speed sensor circuit. I pulled up a wiring diagram for the output speed sensor on this car and identified the circuits as being a purple wire and a yellow wire as a twisted pair. With this information I went back to the car and as you can see in the picture, I had a chafed purple wire in a twisted pair with a yellow wire. This was certainly my problem. With my diagnosis complete I turned in this information to the service advisor to sell the work. The customer was happy to hear it was likely a simple problem and gave us the authorization to repair the wires and recheck. At the initial inspection we did a pan inspection and the pan was clean and just had some old-looking fluid inside. We serviced the transmission and set off to repair the wire. We repaired the chafed wire and wrapped it back up with electrical tape and put some new conduit around it to protect it and prevent this from happening again, then secured it back in the bracket. With the service and repair complete and everything buttoned up, I set back off on a post-repair test drive to see if the problem was fixed. Everything worked as designed and the speedometer never exhibited a glitch again. I was happy with this so we notified the customer that his car was ready to pick up. The customer was eager to get his car back and get on the road with it. We waited a couple of days and gave the customer a follow-up call to see how things were going with the impala. The customer was very happy and reported the car was working great and has not acted up since. The moral of this story is to never under estimate a good visual inspection. I have found many problems without the need to go into in-depth testing simply by looking around and paying attention to the small details such as plastic conduit that has fallen off a wire loom. Paul has been with Certified since 2010 but had many years of experience in the general repair industry prior to joining our team. He started with us by doing R&R work and then trained to be a diagnostician, which is what Paul is currently doing at our Bellevue, NE location. A customer had brought in her 2010 Ford Escape equipped with a 3.0L Engine and the 6F35 transaxle. The customers concern with the vehicle was that the transmission slips intermittently. We started our evaluation with a quick visual inspection of the vehicle and checking fluids, all which check out good. Then I scanned the car with the scan tool; all of our locations have Snap-On Zeus workstations and I had two codes: a P0297, “Vehicle Over Speed Condition”, and a P1500, “Vehicle Speed Sensor”. No codes in any other modules. The next step was to go for a test drive and see if I could duplicate the complaint. When cold, the vehicle worked correctly for about 10 minutes of driving, then out of nowhere the transmission acted like it had a mind of its own by shifting erratically. I also observed the speedometer going up and down while maintaining steady speed. I pulled up the output speed sensor PID on the scan tool and found it also was reading all over the place. (Figure 1) is from a startup without moving at all. I brought the vehicle back to the shop to do a visual inspection, and when I opened the hood I found the battery terminals were severely corroded, the fluid was slightly varnished and reddish brown in color, but had no burnt odor. I have had several speed signal issues before that I had resolved with cleaning the battery terminals and the grounds connected to it, so I figured it needs to be done anyway and could possibly take care of the issue. I cleaned the battery terminals and performed the battery and charging system test. It had passed and did not even pick up any AC ripple, which kind of surprised me because I expected to see erratic test results here. I went for another test drive and it was still acting the same way. Upon returning to the shop again I brought up service information on the PC and checked to see if any TSB’s were available for either of these DTCs, and none were found relating to this particular issue. I also looked at a few other resources I have access to and again found nothing. The next step was to get into some in-depth electrical testing. I printed off the appropriate wiring diagram so I could see how the circuit works and what to expect. I also printed off the diagnostic flowchart; the flowchart for the P0297 did not reveal much information and the one for the P1500 was going in different directions depending on the application. To make matters worse, the information was confusing due to the pin numbers not matching the connectors on my application. After I got that all straightened out and I knew what I was looking at, I continued on with my testing. I checked to see if I had good battery voltage for the sensor at the case connector and it checked out fine. Next I wanted to make sure the ground circuit was good since the battery had a lot of corrosion. I only had 0.05v voltage drop on that circuit which is a good ground, so I knew that was not the cause, either. I decided it was time to get the scope out and take a look at the speed sensor signal circuit, so I back probed the circuit at the PCM to see if the signal was good going into the PCM. It was a not a clean square wave signal at all, never reaching 12V and also not pulling all the way to ground (Figure 2). So I went to the case connector and back-probed the same circuit and tested and the signal looked more like what I was thinking it should look like (Figure 3). I now knew that I have a bad signal at the PCM and a good signal coming out of the unit, so my conclusion at this point was that there was an issue with the harness somewhere between the transmission and the PCM. I removed some components to gain access to the harness. After removing the battery and battery tray I noted that there was a lot of dried up corrosion in the battery tray as well as underneath it. Directly below the battery tray is where the harness was routed and I saw signs deterioration of the electrical tape and split loom. Could this be where my problem was? I then removed the taped and loom to expose the wires where I noticed the insulation on some of the wires didn’t look quite right, and appeared swollen (Figure 4). Back to the scope, I used a wire piercing lead and connected on the TCM side of the “swollen” wire (Figure 5) and had a good signal, then connected to the PCM side expecting to see the bad signal just like I had at the PCM, but did not; the scope reading looked normal. I really thought I had nailed down where the problem was, and visually I was not seeing anything else that looked out of place. I then realized what I had done; I had changed something didn’t I? Yes, I did. These wires were all taped up tightly before I took the wire covering and the tape off, so I connected my lead back up to the PCM side of the loom and grabbed a hold of the wires where it looked damaged. I could get the scope pattern to change just depending on how hard I clenched my fist. (Figure 6) is a close up of one of the wires in question. I carefully split the insulation to get a closer look at the inside of the wire. Upon getting the insulation split open I found a couple wires that had heavy corrosion. The worst one was circuit VET26 which was the output speed sensor signal to the PCM. I then cut out the bad section of the wires and installed new wires in their place. After the repairs were made I rechecked the signal at the PCM and it was now very clean. The vehicle now performed correctly on the test drive. While the wire inside the insulation was corroded, I do believe that it was more in the breakdown of the wire insulation not being able to shield the wire from induced voltage than the corrosion of the wire itself. Carman has been in the transmission industry his entire career, and has been with Certified Transmission since 2003. He has held ASE certifications for over 25 years. He is married with two children, and enjoys camping and riding ATVs. I wanted to share with you a couple of situations that I have run into over the past couple months. The first one is a 2010 Lexus RX350 that came in on the back of a tow truck. This SUV is equipped with a 3.5L V6 and a U660E transaxle. The customer had it towed because the vehicle was in failsafe mode. When I began the evaluation, the first thing I noticed was the strong odor of battery acid when I opened the hood (figure 1). One look at the battery and I knew this was going to need to be addressed, but at this point I do not know what is causing the failsafe problem. When the scan tool was connected I discovered that I had no communication with the TCM, but did have communication with all of the other modules. All of our initial diagnostic evaluations include a battery and charging system test. I’ll bet you can guess the outcome of this one; the battery failed, but the alternator had passed. At this point we informed the customer that some electrical testing was going to be necessary in order for us to find out what was causing the problem. The customer agreed to that and we then proceeded with the job. 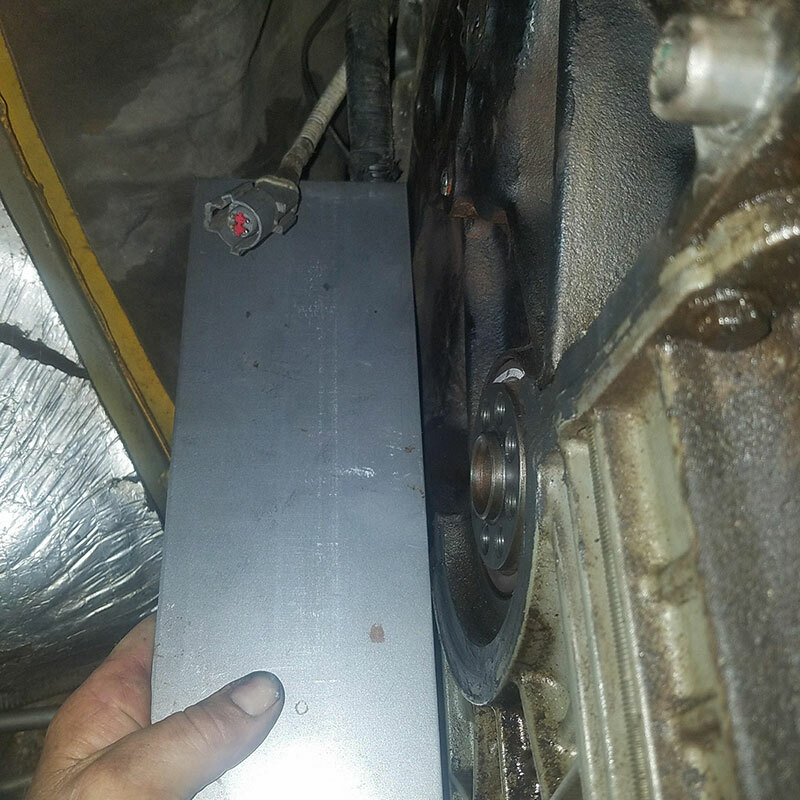 I am sure that you guys have seen these vehicles in your shop and know that the battery is positioned directly above the transaxle, so knowing that and the fact that the battery had evidence of leaking acid, I knew where I was headed. The TCM is mounted directly on top of the unit and plugs directly into the transmission case connector. I started by checking power and grounds on the vehicle harness to the TCM and found everything in order. I disconnected the harness and everything looked good with no corrosion or pin-fit connection issues. Next I removed the two bolts that hold the TCM to the case. The TCM just fell off onto the floor, and I was not expecting that! The case connector and the TCM were corroded so badly that four of the pins and the plastic housing were stuck in the TCM. I think I found the problem! (figure 2 & 3) My next move was to recommend a pan inspection to see if there was any need to go inside the transmission, or just replace the internal harness and TCM. After dropping the pan it looked good inside, no clutch material or excessive metal. I then recommended replacing the internal harness, TCM, battery, and a transmission fluid flush. The parts were a couple of days out, so while I was playing the waiting game I cleaned the area as best I could and installed the new battery. When the parts arrived I pulled the valve body down and replaced the internal harness, installed the TCM, and flushed the transmission fluid. The TCM came already loaded with the calibration so all I needed to do was the initialization procedure, reset memory as Toyota/Lexus call it, and go for a road test. The transmission shifted as it should and I couldn’t be more pleased. The customer was also pretty happy that they did not need to replace the transmission. The next vehicle I wanted to discuss had an issue that you will not see that often. The car was a 2006 Hyundai Tiburon with a 2.0 liter 4 cylinder with an A4BF1 transmission. While going through the initial evaluation and connecting the scan tool, it had a DTC stored for P0711 TFT signal abnormal, but no other codes. The customer concern was that everything seemed to work fine but, the CEL light would “come and go”. After peeling the tape and wiring loom off the red wire, I could see that it was spliced into the yellow/black wire in cavity #5 of the MAF sensor pigtail. The other end of the wire was spliced into the gray wire cavity #1 of the transmission case connector, which is for the TFT sensor. (figure 5) I talked to a couple of colleagues about this but they had never seen nor heard of this scenario. I even tried the tech support search, but nothing came up. My theory is they were trying to trick the ECM into thinking it was running cold so it would richen up the fuel mixture and supposedly get better power and performance. I just could not figure out why we went to the transmission temp sensor. Maybe they were trying to have the IAT temp and transmission temp match? I wish I knew what went through some of these people’s thought processes. After returning everything back to a factory configuration, I serviced the transmission and went for another road test. Watching the scanner, the TFT sensor was rising as it should, and when it was warm enough the TCC would now engage as it was designed to. We called and let the customer know his car now works like it should and he was happy that the source of the intermittent CEL was solved. Both cases could have turned out worse for the customers, but a happy customer means repeat business. Randy has worked for Certified Transmission for over twenty four years and is an ASE Certified Master Technician, including L-1. He has been in the automotive industry for over 30 years. A customer brought her 2006 Chrysler PT Cruiser to our shop with a complaint of random high engine revs. She stated that restarting the engine resets the vehicle and it works again temporarily, and this had been going on for about four months. The vehicle had a 2.4-liter turbocharged engine with a 604 transmission. The diagnostician performed the initial road test and collected some preliminary information. There were diagnostic trouble codes stored in the PCM. This was an NGC 4-plug computer, so the ECM and TCM are in the same module. The codes stored were P0700 (turns on the MIL), P1684 (battery was disconnected), and P0882 (TCM power input low). He was unable to duplicate the symptoms on the initial road test. There were also radio communication codes stored because the radio was not the factory radio. It also had an external audio amplifier and big subwoofers. At this point he was not sure if this is related, but took note of it. There was also a leak noted at the transmission pan, as well as a negative battery terminal in poor condition. The diagnostician recommended more diagnostic time to investigate the P0882 code and reseal the pan. The customer authorized the diagnostics and transmission service. Battery connections are crucial in today’s vehicles. A small amount of voltage loss can wreak havoc. The first step was to correct the connection problems. He replaced the negative battery terminal with a factory type cable end crimped onto the cable. The transmission was serviced to solve the leaking transmission pan, and the codes were cleared. The PCM calibration was checked and confirmed that it was up-to-date. The technician then drove the vehicle on multiple road tests to ensure the DTC would not reset. Confident that the poor battery connection solved the problem, the vehicle was delivered back to the owner that Friday afternoon. The Transmission Control Output circuit is used to supply power to the Transmission Solenoid/TRS Assembly and to the PCM when in normal operating mode. The purpose of the Transmission Output circuit is to allow the Transmission Control System to turn off the power to the Transmission Solenoid/TRS Assembly in the event that the transmission should need to be placed into “limp-in” mode due to a DTC. After a PCM reset, (ignition switch turned to the run position, or after cranking the engine) the Transmission Control System verifies that the Transmission Output circuit is open by checking for voltage on the Transmission Output circuits before the Transmission Control System request for the circuit to be powered up. The request is sent by a direct circuit control from the PCM to the TIPM. If the Transmission Control System detects less than 3.0 volts when the output is commanded on, the DTC will set. Note: Inadequate Transmission Control Output voltage can also cause DTCs P0846, or P0871, to set. This does not indicate an internal transmission or solenoid/TRS problem. Repairing the P0882 fault should also eliminate the related DTCs. When the ignition is turned from “OFF” position to “RUN” position and/or the ignition is turned from “START” position to “RUN” position. It was concluded that the TIPM was at fault. Since the relay is internal to the TIPM we could not test or jumper the relay. A remanufactured TIPM was ordered from the dealer and installed. The vehicle was driven several more times and seemed to be fixed. The customer picked the vehicle up Friday afternoon. I wish the story ended there, but it didn’t. Monday the vehicle came back once again. As before, the warning lights were on and the transmission was not shifting. P0882 was stored but there was a new code that had not been there previously, P1603 (PCM internal dual-port ram communication failure). This basically tells us there is an internal failure in the PCM. We need to check powers, grounds, and perform a wiggle test with the circuit live. No external problems were found so a replacement PCM was recommended. The customer opted for a used PCM. We installed the used PCM, updated the VIN and programmed it to the latest calibration. In the back of our minds was the thought, could this have been the source of all the P0882 issues? An internal PCM problem? After a week of road testing, the code had not reset. The customer picked the vehicle up just to bring it back an hour later. It seemed that we still hadn’t conquered the P0882 code. We replaced the TIPM and the PCM. What else could it be? So many times we replace a component only to have the same problem. So, we assume the component is good because we just replaced it. We skip over the diagnostics to try and condemn something else. Continue where we left off. I have been guilty of this more times than I would like to admit. We have the same code, same symptoms. We could not assume anything and had to start from beginning. So, that’s exactly what we did. So why is the voltage dropping out? Is there a problem the TIPM is seeing? It didn’t appear so. If there was an issue with a solenoid or circuit, the voltage would be cut off immediately and not gradually/erratic cycle off like we saw in the scope capture, and we would likely have a DTC from the guilty component. We are going to test everything again anyway. Again, we are going to test all the circuits controlled by the Transmission Control Output. We had no solenoid codes, but we were not going to assume anything at this point. So as to not to overlook the grounds, we performed a voltage drop test. We tested at the G104 grounds and got a reading of .008 V with the engine running. With connector C10 disconnected from the TIPM and the C4 connector disconnected at the PCM, a resistance test was performed on each of the solenoids. I do not like to rely on resistance measurements alone, but since the circuit would not stay alive long enough to run the test through the scan tool and we could not jumper the relay, we had to settle for this test. Each of the circuits passed the resistance test without issue. Once we determined nothing outside the TIPM was causing the issue, we condemned the TIPM. We called and had our faulty TIPM exchanged at the dealer. The TIPM was installed and the vehicle was driven. We drove the vehicle every day for over a week and the code did not return. We crossed our fingers and returned the vehicle to the customer. It’s been well over a month now and happy to say we have not seen it back. Second-guessing the parts we install is a tiresome prospect. In cases like this, sometimes it’s the only option left to pursue. While it may make you feel like you are simply repeating diagnostics and the exercise is redundant, it may be the only way to solve the issue for your customer. Stay positive, and stay with it. Assume nothing. Just because a part is new, doesn’t mean it’s good. Kevin is a Diagnostician at our Liberty, MO Certified Transmission location. He has been with the company since 2014. Kevin has been in the automotive field for 24 years, specializing in engine, transmission and electrical diagnostics. He is an ASE Certified Master Technician with L1 advanced level diagnostics certification. Like many of you, this time of year I am usually asked to assemble a variety of items and gifts for my family members. In light of these requests, I have spent a significant amount of time analyzing why we waste so much time assembling, dissembling, and re-assembling items out of an unwillingness to simply read the instructions; many times this process results in leftover spare parts and frustration. I often marvel at how this happens, considering the detailed product resources typically provided by the manufacturer. This information usually contains step-by-step instructions that, when followed, virtually guarantee success. Yet, whether due to pride, an attempt to save time, or simply thinking we know better, more often than not we fail to take advantage of this information. It is this concept of properly using information that I wish to apply to the diagnostic automotive field. We often spend time projecting what we believe is going wrong onto the vehicle diagnosis, rather than diagnosing the vehicle with an open mind and allowing the vehicle to dictate the direction we should go. We fail to look up the information necessary because we assume we understand what is happening. When there are not direct, step-by-step instructions on what the problem is, almost all of us have a way of gathering information about how a system works. These might include wiring diagrams, apply charts, and Passbooks with information and notes added to them from previous experiences. Time, money, and effort are wasted when we fail to develop a systematic approach to the diagnostic process. A systematic approach is a step-by-step process which is followed the same way each time, allowing the vehicles facts and symptoms to dictate the direction you go. In order to develop this step-by-step process, one should have a written sheet of the exact vehicle symptoms presented alongside an apply chart, applicable diagnostic sheets for codes, wiring diagrams, and system operation information. By spending time gathering information and working through the problem on paper before ever taking anything apart on the vehicle, you can quickly come up with a approach that should include starting with the quickest, easiest checks first and working your way to a more detailed or intrusive test if needed. I have found that it is so much easier to quickly eliminate the things that can’t cause the problem when all the information is sitting right in front of you. This allows a visual, more accurate picture of how the specific problem you are having could have been created. Additionally, this process narrows down the problematic possibilities, leaving a list of fewer things that could be a potential cause. Recently I encountered a situation that I believe adequately illustrates my thoughts. The vehicle was a 2003 Chevy 2500 pickup with a 6.0 liter engine and a 4L80E transmission. Upon its arrival, I was informed that the vehicle had been to two previous shops before arriving at our shop. This truck was an old farm truck and had been treated as one might expect a work truck to be treated. The customer?s complaint was the vehicle staying in a lower gear at times, and also had erratic shifts. The first shop replaced the transmission first with a used unit, and then recently rebuilt one. The symptoms remained the same through the transmission changes, and led to the customer becoming aggravated and taking it to a different shop. The new shop replaced every electrical component inside the pan in an attempt to solve the problem. This also had no effect on the complaint, which resulted in the shop recommending the customer to bring it to our facility. Upon test-driving the truck, I noted that it would shift into the 1st, 2nd, 3rd, and 4th gears, but a little on the firm side. After achieving 4th gear (which it would only do for 2 to 5 seconds), the transmission would quickly go back into 2nd gear and stay there until I brought it to a stop. As I started through the gears again, the exact same pattern would happen. Once it downshifted to second, it would not come out unless I brought it to a complete stop. I also noted that as I downshifted out of overdrive the transmission would shift into 3rd gear. This screenshot is from the truck when it was stuck in second gear. Next, I sat down with my check-out sheet and retrieved a copy of an apply chart from my 4L80E Passbook, a complete transmission circuit wiring diagram, and diagnostic code description sheet for the P1860 code. The first thing that stood out to me when looking at the apply chart was that in this transmission, both solenoids off would be 2nd gear. (Figure 2) In like manner, both solenoids on makes 4th gear. I decided to test voltage to all the solenoids at the ignition fuse 0 in the fuse box. To me this seemed to be the fastest and easiest test and would lead me to the cause of my problem. I removed the fuse cover and used my voltmeter to check voltage at the fuse (Figure 4). Sure enough, I only had 4.98 volts key on. If I played with the ignition switch, voltage would vary but would never go over 6 volts. This would obviously cause the problem that the truck is having. Voltage is enough to fire each solenoid individually but when both are commanded on, current is insufficient to operate both solenoids at the same time and it then goes into second gear. I recommended an ignition switch 23 minutes after I climbed into the car for a test drive. The ignition switch was replaced and the transmission shifted normally with no codes. I know this is a problem many of you may have seen before. The diagnostic process was basic. However, keep in mind that this vehicle had been to two other shops and the customer had spent a significant amount of money and time attempting to solve the transmission problem. I believe this was due to a lack of organization by the other shops and failure to gather enough information about what exactly was going on. Rather than taking an organized, systematic approach, supposed solutions were thrown at the problem in an attempt to fix it. Almost always, this is because we don’t completely understand what it is that is happening. Gathering, printing and writing down all the information during the initial check-out may seem like it could take a significant amount of time and effort, especially when gathering it for the first time. After you develop the discipline to do so, it becomes a comfortable process. Having all the necessary information in front of you enables the easy organization and understanding of potential causes. With the correct information you are able to know, and not just assume, keeping you on a focused track to finding out what the problem is, and significantly saving wasted time, money, and effort. This process alleviates mistaken thoughts and helps us remain focused, addressing the problem as a new one, not projecting previous diagnoses onto the vehicle. To me it is clear: by taking the time to gather a complete and accurate list of information and working through the problem on paper, it will always help you make a more focused and efficient decision. Chris Adams started with Certified Transmission in 1986 as an R&R technician, and currently works as our Diagnostic Trainer. His current duties involve training and advising our retail diagnosticians, as well as assisting in the research and development of our remanufactured products. He also holds ASE Master and L1 certifications. Sometimes despite your best efforts you can still manage to shoot yourself in the foot. The following account is a prime example of this; while this happened on one specific vehicle, it could happen on any number of vehicles where the cause is the same, but could have different end results. One of our shop locations had a 2011 Jeep Patriot that came in on the back of a tow truck. The customer stated that it started making noise and then quit moving. This one was an easy checkout; the vehicle didn’t move in any direction, had metallic-looking fluid, a horrendous bearing noise, and had a P0777 (secondary pressure control solenoid stuck on) code stored. Even though this one was pretty much a slam dunk in the way of diagnosis, we still needed to go through our complete evaluation procedure. The Jeep is equipped with the 2.4L engine backed up by a JF011E CVT transaxle (the Nissan version is the RE0F10A). Since we started remanufacturing the CVT applications these transmissions have been selling really well. The Service Advisor contacted the customer and let them know the results of our evaluation, and how much the completed job would cost. The customer agreed to the repairs and the remanufactured unit was installed. After a R&R is completed, the job then gets handed off to me. One of the things we do in our evaluation is check to make sure the software calibration is current, and this one was not. There were updates to both the ECM and the TCM. Each of our locations have a subscription to the Tech Authority website that we use for service information and programming, and we use the FCA J2534 software and a Snap-On pass-thru pro +4 to complete the required reprogramming for these applications. The next thing that needs to be done on these units (can be done before or after programming) is to initialize the CVT transmission with a capable scan tool, and in this case we use the Snap-On Zeus workstation. After the transmission is installed the TCM will set a P167A (calibration mismatch) DTC. This procedure only takes a couple minutes from start to finish, and then you can either clear the DTC or after a couple ignition cycles the code will go away on its own. Now we were ready for the road test. It didn’t take long to notice that we still had a problem as the vehicle had a really bad rolling surge. I immediately returned to the shop so I could check the fluid level, hoping that maybe we didn’t get the fluid level to full, but this was not the case; the fluid was at the correct level. I took the scan tool and set up a custom data list of all the PIDS I thought I needed to look at, and went for another road test. This time I had an associate drive the vehicle so I could watch the scan data, and the vehicle was still exhibiting the rolling surge. Watching the scan data, I could not see anything that was causing it. I could see the results of the surge, and I could see what I thought was causing the CVT to surge, but I just could not comprehend why. I could see that the PL solenoid monitored current and output current were going right along with the engine RPM and the primary pulley RPM, but was this the cause of the surge, or a result? I still did not see anything that would cause this, so I scrapped the custom data list and just brought up the entire PID list for the TCM instead. While the data updates at a slower rate when you are looking at so much data simultaneously, I had to do something different. The technician attached the main battery ground up to the throttle body bracket that is mounted with rubber bushings on each side, rather than to the starter bolt right next to it. We moved the cable over to its proper location and the voltage drop looked good everywhere I had checked, so now it was time for another road test. The PL solenoid current was smooth as was the engine and primary pulley speed. There were still some unswitched battery voltage irregularities but they were not affecting the operation of the transmission. I am suspecting that there might have still been some issue with the alternator function, but I have not had another one of the same vehicle that I could compare it to. I think we have all had our tails kicked by a bad ground, but this one had so much of a mechanical feeling effect of the operation of the unit that it really surprised me. My initial reaction to this when I was driving it was that I was going to condemn the remanufactured unit, as I think it would have been a fairly easy call to make. As the manufacturers are adding more complexity to the electronic controls inside the transmission in the way of more solenoids and even pumps for the stop/start systems, the electrical current required to run the transmission keeps increasing. This in turn will require the entire electrical system to be in perfect working order to keep everything working as it was designed. John has been with Certified Transmission since 1990 and is an ASE Certified Master Technician. John is married and has two sons. His hobbies include helping his son’s work on their Sport Compact, Figure 8 and Demolition Derby Cars. I had a 2006 Ford Ranger towed into our shop with the complaint of the transmission slipping in both forward and reverse ranges. The truck was a 4 wheel drive and equipped with the 4.0 engine and a 5R55E transmission. This was a fleet vehicle with 201k miles on the odometer. Upon initial road test and analysis, the transmission did indeed slip in both directions. I observed dark and burnt fluid which signaled internal damage requiring replacement of the transmission. After receiving authorization from the customer, the transmission was removed from the vehicle. Our shop policy includes instructions and a checklist of associated items to check anytime we remove a transmission. One thing that I started doing several years ago was to remove the flex plate for two reasons: 1. inspect the rear main engine oil seal, and 2. inspect the flex plate. When I clean off the surface that mates up to the crankshaft, often times there are signs of stress that will lead to a broken flex plate before it actually occurs. This example was not from this vehicle, but illustrates the point. (Figure 1) Our subject vehicle’s flex plate looked good, so the transmission cooler was flushed with a Hot Flush machine and I was ready to install our remanufactured unit into the vehicle. I always use high temp grease on the converter pilot and the dowel pins when installing a transmission. The truck had passed the electrical system analysis, so the PCM was updated with the latest calibration using a J2534 device and the FJDS software. Having completed these tasks, I was ready to road test the vehicle. Our normal road test consists of both in-town and highway driving, and everything was working as expected. The truck passed all of our final checks for proper installation. This vehicle was ready to deliver to the customer to be put back in service. Fast-forward about five weeks and 2,000 miles. I received a call from our customer explaining that the truck now had a grinding noise that sounded like it was coming from the bellhousing. I submitted a tow to get the truck back to our shop ASAP to find out what had happened. When the vehicle arrived at the shop, when attempting to start the truck it emitted a very unpleasant grinding noise. We pushed it into the shop for further inspection. All the bolts were tight, and everything looked like it was supposed to. I then removed the starter for further inspection. When attempting to turn over the engine using a pry bar on the teeth of the flex plate I could see that the flex plate was broken and the transmission would have to be removed for inspection. After the transmission and flex plate were removed I saw that the entire center was broken out. The converter nuts and flex plate bolts were all tight, nothing was pinched in the bellhousing, the dowel pins and the holes in the case were in good shape, so this lead me to suspect some type of alignment issue. I removed the torque converter and sent it to our converter shop to have it checked. The converter passed inspection, but a remanufactured converter was sent to replace it just to be sure. With no root cause for the breakage yet identified, I had to determine what may have broken the flex plate in such a short amount of time. I ordered a new flex plate and crankshaft spacer due to damage from the broken flex plate. The backing plate between the engine and transmission was inspected for signs of distortion. I broke out the dial indicator to check crankshaft endplay and runout. The crankshaft endplay spec is between .002-.0126″ and was within that spec, as was the runout. (Figure 2) Still left without any direct cause identified, I was thinking that maybe the flywheel was just stressed from the 200k miles of service, but I had to be sure. I brought out the straight edge and checked the face of the transmission which mates to the engine. Again, everything checked out good. Next I checked the rear of the engine block which mates to the transmission. As the straight edge was moving down the rear of the engine to the oil pan it stopped; the engine oil pan seemed to be projecting out past the engine block mating surface! This was a problem since the transmission also mates to the engine oil pan, but couldn’t explain why is it hadn’t broken the flex plate prior to the transmission replacement. A phone call to the customer explaining what I found shed some light on the situation. The customer explained to us that a short time after I installed our transmission it went to another repair shop for engine work. The engine had been removed and one of the repairs involved the engine oil pan being removed. At this point I received authorization to remove the oil pan and inspect. I had found upon removing the oil pan that the oil pan bolts had enough wiggle room in the bolt holes to shift the pan past the mating surface of the block. 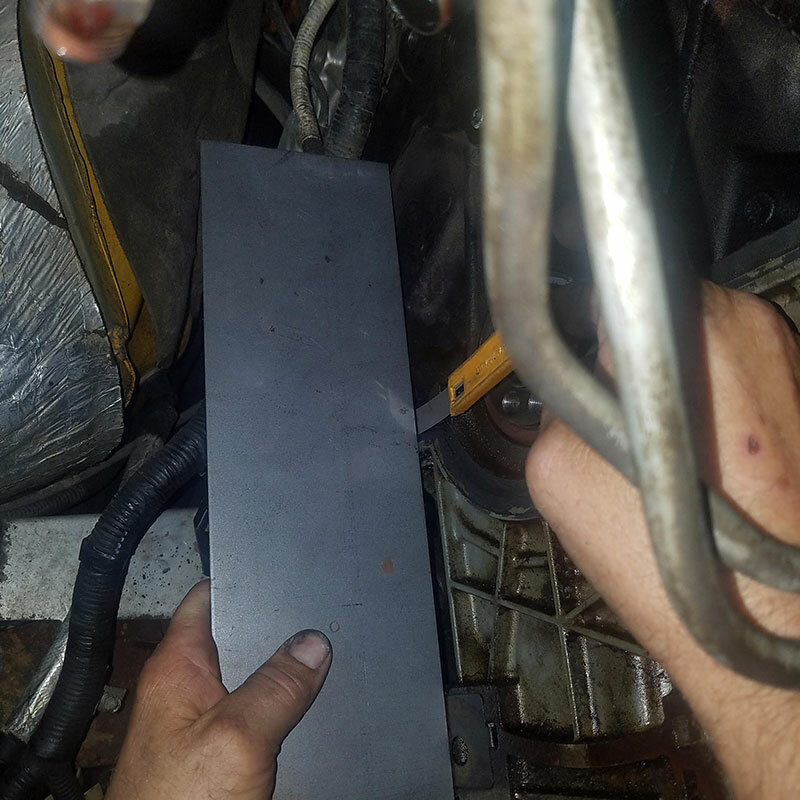 I installed a new pan gasket with a straight edge at the back of the block to make sure the oil pan was flush. I installed the new adapter and flex plate and proceeded to install the transmission. Once the installation was completed and double checked, the truck was road tested several times and brought back in to check for noises and leaks. The truck was returned to our customer in good working order. It has been five months since the repairs were done on this truck, and no further flex plate problems have arisen. The truck is still in service and is seen occasionally driving by the shop. Dana joined with Certified Transmission in 1991. Dana has worked in all positions at the Lincoln location, starting as an R&R technician and is now our current diagnostician for our Lincoln, NE facility. He enjoys car racing and spending time with family and friends. A customer brought in a 2010 Dodge Journey AWD with the high-output 3.5 V6 engine and the 62TE automatic transmission. With a little over 83,000 miles on the odometer, the complaint was for no upshifts and stuck in 3rd-gear failsafe mode. This concern had started out as an intermittent issue but now had become more regular. The preliminary visual inspection was performed and a diagnostic tool was connected to scan for codes in the electronic systems. The fluid level was noted as being a little low and there was a slight transmission cooler line leak. The condition of the fluid was still red in color. The scan tool pulled several DTCs as follows: P0765 (underdrive solenoid circuit), P0750 (low/reverse solenoid circuit), P0562 (battery system voltage low), and P0755 (2-4 solenoid circuit). There were also some body control codes set: B21A1 (ECU reset) and B25AC (door module not calibrated). 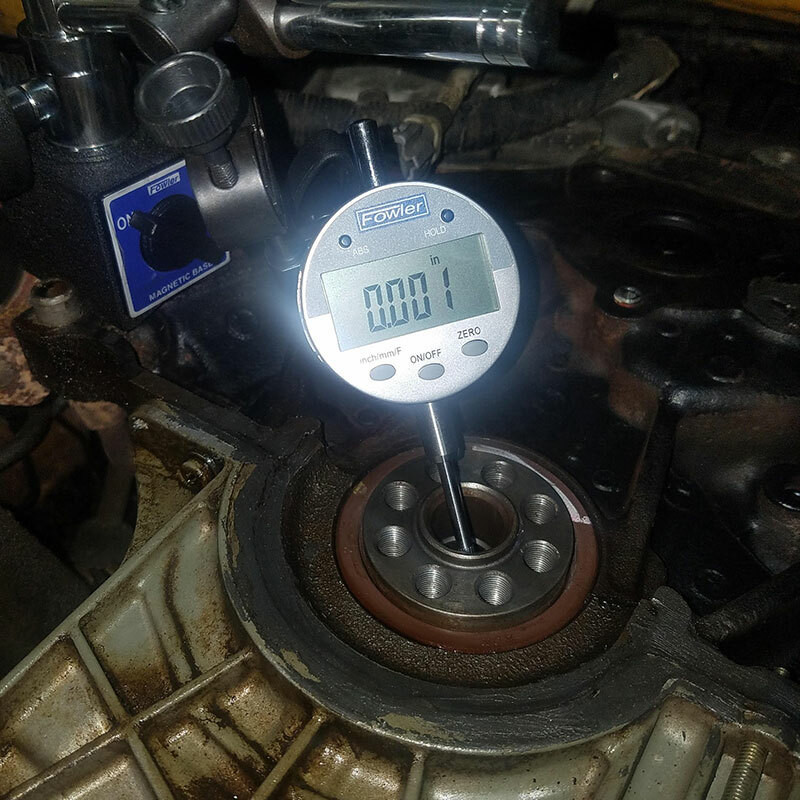 We try to make sure we always scan all systems when scanning for codes rather than just concentrating on the engine and transmission; it is a practice that has served us well over the years. As shown, there are multiple causes for this code. A common cause for this code is a gradually failing battery or alternator with voltage that falls below 10.0 volts for 15 seconds. One of the things we do as part of our routine checkout is a battery and charging system test. Today’s vehicles are very sensitive to battery voltage changes, especially low voltage, and excessive AC ripple. We have seen many issues caused by excessive alternator ripple, ranging everything from codes to erratic speedometer operation and erratic shifting. We also checked the grounds for corrosion and that they were tight. Once in a while we can get wrapped up in finding a complicated electrical issue and overlook the simple things, like poor ground paths. In this case everything checked out so we moved on to the next step: a battery and charging system test. We are focusing on circuit T16: the transmission control output circuit. This circuit branches off in three legs from the PCM. There is a connector C105 and C101 between the PCM and the TIPM. I wanted to verify that the TIPM was energizing the transmission control output. This happens on the Yellow/Orange wire from the transmission control relay in the TIPM. We used the snap on scope to monitor power and hopefully catch any quick dropouts in power. With key on engine running I was able to confirm that the TIPM was in fact sending out the signal on T16. Having verified that the PCM was sending the command, and that the TIPM was receiving the command then sending the signal output, it was apparent that the signal was not reaching the transmission solenoid assembly. This led us to looking at the wiring and connectors that were left in the circuit. With the scope still attached at the previous points and the engine running we started moving wires while watching for any voltage changes. At this point the vehicle had come out of limp and of course we had power at both points that the scope was hooked to. After a few minutes of run time while wiggling wires, the vehicle again went to failsafe mode and set the P0562 code. The connector was taken apart to check for damage or corrosion on the pins. The connector appeared to be sealed with no damage to the weather pack seal. No corrosion was found. However, the pin fit from male to female was not very tight. Once we isolated the area of the problem, a new wire connection was temporarily made to go around the loose pin at C101. The vehicle was tested multiple times and no more issues were noted. A complete system scan showed no codes present. It has been out on the road for several months now and after checking in with the owner it has worked without incident. Since the time we had diagnosed and repaired this vehicle, we have had another come in that had the same code and symptoms. It was found to have the same connection problem at the same connector. If you have one of these vehicles come into your shop with this concern, make sure you verify the presence of voltage where it needs to be, and if there is a loss, where it is being lost. While these do have some common problems with TIPM failures as well as PCM issues, take the time to isolate the problem and you may just find a connector issue like I did. I am sure there are other Chrysler vehicles that may have a similar setup to this Journey, so it would certainly be worth your time to take a look. As CVT transmissions are appearing in our shops with increasing frequency, there still seems to be a degree of hesitance for some shops to take on these jobs. Even if shops do not want to build these units in-house, there are reliable sources for remanufactured units out there that enable them to capture profit on R&R rather than sending a customer down the road to a competitor. Shops must be able to diagnose the correct operation of the unit, and in a nutshell, it is a relatively straightforward process. There are only four solenoids, and two of them are for TCC operation. There are two pressure sensors that are really easy to verify operation (at least after a gauge or pressure transducer is connected), and we will get into those details later in the article. Lastly, there is a stepper motor in place to control the variable ratios of the transmission. The stepper motor is what is new to us transmission guys, and while some stepper motors can get extremely complicated, the ones used in the Nissan/Chrysler applications are not. There are a few ways to test a stepper motor on the bench. A simple resistance check is one of them, and since I have never seen the specs posted, we will cover that first. Refer to (figure 3). Measuring between each leg (phase) should produce a result of 15 Ω. If you connect a DMM between pins 1 and 2 you will get 15 Ω (figure 4), and connecting between 1 and 3 and you will see 30 Ω. Pins 2 and 5 are the grounds so it doesn’t really matter which side you start from; the second pin in from either side will be a ground. This is just a quick test to make sure you do not have an open or short, and I would always try to run the motor in and out for more of a “live” test (be sure to use some type of controller; do not just apply a direct 12v to these circuits as these windings use a very fine wire and can heat up quickly). There are stepper motor controllers that can be purchased that are used only for running the motor in and out, but another option is to build your own if you really like to tinker with stuff. I am not going to go into all the specifics here but there are kits you can buy that utilize either Arduino or Raspberry Pi boards, and a simple web search will turn out tons of results including videos that will show you how to build it. For this application you need a six-wire unipolar stepper motor controller. Now we’ll move on to some cool screenshots from the scope. The top section on each of these screen captures is the main view which has the entire recording in it, and the bottom section is the zoom view which will only show a focused section from the main view. This scope has math functions built-in that allows for measuring the results from any point, either between cursors for a Duty % or Hz reading, or at a specific point for a voltage reading. We are using ten channels, four for the solenoids, four for the stepper motor, and the last two are Pico pressure transducers connected to the primary and secondary pulley pressures. When Certified Transmission prepared for remanufacturing these units, we had to make a reliable, repeatable, dynometer test and that was the driving force for us to gather this information. The following capture is a 0-70 mph run that was a total of 46 seconds, and you can see how the stepper motor is more active at the start and gradually slows down as the ratio stabilizes. The zoom window only contains two seconds of operation. The next capture is close to the same recording time as above, but we used the manual shift option where you can see clearly defined ratio changes for each gear selected. The zoom window is only one second of the main window, so the completed ratio change from the theoretical 1-2 gear shift took just a little over .7 seconds to complete. Displaying Park, Drive, Drive Stall, Neutral in this capture shows TCC on/off solenoid responding to the gear selector changes, and since the vehicle never moved there is no operation of the stepper motor control. This is where we obtained the pressure specs for the Pri/Sec Pulley pressure. At stall the PC solenoid is running at 15% +duty and the secondary PC solenoid is basically shut off. These readings result in 248psi at the primary pulley, and 410psi at the secondary pulley. At Idle the PC solenoid is running at 45%+ and secondary PC is at 36%+. Corresponding pressures are primary 138psi and secondary 197psi. All three of the PWM solenoids run at 800Hz. A word about pressure testing: BE CAREFUL! Although some of the pressure taps on this unit can be tested with the same equipment that you have used for years, there are others that you can’t. I haven’t put this unit into failsafe mode to see what would happen, but just normal operation of the Ford CFT30 transmission (as an example) can run close to 900psi of pressure. If you own a Snap-On Verus or the newer Zeus scan tool, they offer a 0-5000psi transducer that is actually reasonably priced and you can look at the pressure on the scope and enables recording pressure events. Make sure you have hoses that can handle these high pressures as 800psi of hot CVT fluid is nothing to mess around with. We have always gone by the 200% rule, so all of our hoses used for CVT testing have a minimum 2000psi burst rating for safety. These transmissions are getting common in the field. Adequate training, understanding, equipment, and software are the basic requirements for a modern shop to have in order to survive in the latest wave of technology. While these transmissions are certainly more complicated, working on them doesn’t have to be. Daniel is a Diagnostician for Certified Transmission’s Blue Springs, MO shop. As we see numerous cars come into our shops on a daily basis, we often have a diagnosis already in mind based on the customer’s complaint, the type of vehicle we’re working on, road test experience, and symptoms. That’s the benefit of specialized repair. Sometimes the actual in-depth diagnosis proves us right, and sometimes proves us dead-wrong. A critical part of an accurate diagnosis by the technician relies on the initial interaction between the customer and a skilled service advisor. A good advisor knows how to get details about the problem from the customer, including valuable information that the customer might otherwise feel is insignificant or unimportant. Sometimes these seemingly insignificant details are the clues that lead us to the solution. Sometimes even the best advisor still can’t get all of the details from the customer, or at least up front. Such was the case with the 2004 Chevrolet Tahoe that found its way into our shop. The customer’s stated concern was that intermittently the vehicle barely moves while accelerating, high RPM at highway speeds, and a check engine light is on. Previous experience with this code set led me to believe there was a high probability that I had an ignition switch problem at hand. I was anticipating circuit 1020 from the ignition switch would have a low voltage condition when tested as this would be typical if the ignition switch was bad. A simple voltage test would confirm my hypothesis, and would result in an easy fix. I immediately went to the “IGN 0” fuse to check voltage as I had done so many times before (Figure 2). Testing with the key on, I had 12.28 volts (Figure 3) and no codes reset. Thinking that a failing ignition switch circuit may only fail after being under load for a period of time, I drove the vehicle while monitoring voltage on circuit 1020. After test-driving the vehicle two different times for over an hour and totaling 60 miles, no codes had reset and circuit 1020 voltage never dropped below system voltage. When asked, he stated that he uses the remote start nearly every morning before leaving for work. To the customer this may not have had anything to do with his transmission problem. For me trying to diagnose the problem, this was the smoking gun. Having installed remote start systems myself in the past, I knew that a remote start module is used to power up several circuits coming from the ignition switch in order to enable the engine to start and run. Back to the “IGN 0” fuse I went. With the key off, obviously I had zero volts. When I activated the remote start function, the engine started and ran, but I still had zero volts at circuit 1020. Codes P0740, P0785, and P2791 finally set as well. Problem found! A look under the dash revealed a maze of wires running every different direction from the ignition switch harness to the remote start module. After digging into the mess, I found the pink wire for circuit 1020 untouched. No wire had been spliced into circuit 1020 (from the remote start module) to provide power during remote start activation. Whoever installed the remote start system failed to connect a power source to circuit 1020. With the PCM powered up and seeing no voltage on circuit 1020 during remote start activation, the PCM then sets the three codes and puts the transmission into fail-safe mode. This explains the customer’s complaint of “pushing on the gas/barely moves and high RPM on the highway.” A pan inspection revealed nothing detrimental inside the transmission. We recommended servicing the transmission at this point and advised the customer to NOT to use the remote start system until he returned to the installer to have it correctly wired. This is why we follow through and truly diagnose the problem regardless of speculation. Had I replaced the ignition switch based on GM’s known ignition switch failures and my previous experience with them, the customer would have been back within a day or two complaining of the same problem. Worse yet, he may have been unhappy with us and would be lost as a customer forever. One of the most valuable tools in our industry is communication with the customer. Had my service advisor not been able to reveal the information regarding the remote start on this vehicle, we may still be trying to figure out why we cannot duplicate the problem. We always ask about any recent work done to the vehicle. We now have a line on our customer/vehicle information sheet that asks about any aftermarket anti-theft or remote start systems that might have been installed. Both of these help by opening up conversation with the customer that might assist us in diagnosing the problem more efficiently. Sometimes it is the small details that help us the most. Our customer left happy that he did not need a transmission. He was happy that we took the extra time to correctly diagnose his problem, but the last thing he said before leaving our shop was, “Now that I think about it, the problem only happened when I used the remote start!” Insert face-palm here.